Get in touch with the Wild Side at Florida EcoSafaris at Forever Florida. Experience a wild, natural Florida that most people do not get to see. You can choose your own fully-guided adventure from the Coach Safari, Horseback Safari, and the adventurous Zip line Safari. This special attraction boasts 9 Florida Ecosystems! This wildlife conservation area is home to many native plants, flowers and animals, including white-tail deer, black bears, alligators, and the endangered Florida Panther in their natural habitat. The Coach Safari is an open air coach that brings you on a 2-hour tour through the beautiful 4,700 acre Forever Florida wildlife conservation area. Midway through your adventure, you’ll get a chance to walk the boardwalk that winds through 500 year old cypress trees and takes you over the Bull Creek floodplain. Or, feel like you are going back in time on the Horseback Safari, where you can ride the historic trails the native Americans used back in the 1500s. Choose between a 1, 2, or 3 hour ride through the wildlife conservation area. Horses are individually picked for each rider, and the tour is fully guided, so no need to worry if you aren’t an experienced rider. 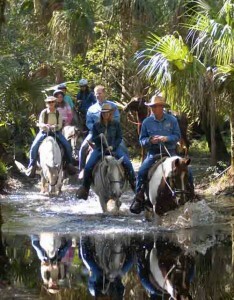 Florida EcoSafaris allow you to see a side of Florida that has been preserved as nature intended. (Approximately 50 miles from the Orlando area.) And is one of the attractions you can go to for free with your Go Orlando Card, which is a discount card for area attractions.